Mappa Mundi and Chained Library Exhibition at Mappa Mundi and Chained Library01432 374202work MuseumThe Mappa Mundi and Chained Library Exhibition at Hereford Cathedral is open all year round and is famous for housing both the medieval map of the world and the chained library. The world famous Mappa Mundi is the largest surviving medieval map of the world and a unique international treasure. It records how the scholars interpreted the world over 700 years ago and contains more than a thousand drawings and inscriptions, showing cities and towns, Biblical events, plants, animals, birds, strange creatures and monstrous races. The Chained Library contains 225 illuminated manuscripts with the earliest dating from the eighth century, and over 1.200 early printed books. 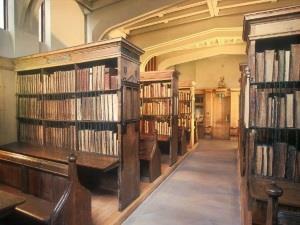 The books are chained to the 17th century cases where they were housed and read. Your visit offers the chance to explore our interpretive exhibition, finding out how and why these unique treasures were created. You will ,eet knowledgeable guides and enjoy the current unique temporary exhibition of rare books, archives and artefacts.